by A. Zygmund, et al. In the theory of convergence and summability, whether for ordinary Fourier series or other expansions, emphasis is placed on the phenomenon of localization whenever such occurs, and in the present paper a certain aspect of this phenomenon will be studied for the problem of best approximation as well. This book presents the material covered in graduate lectures delivered in 2010. Moving from the classical periodic setting to the real line, then to, nowadays, sets with minimal structures, the theory has reached a high level of applicability. 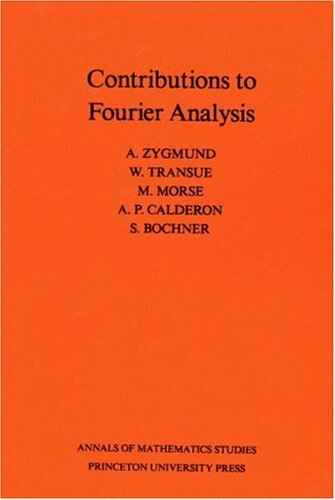 by H. S. Carslaw - Macmillan and co.
An introductory explanation of the theory of Fourier's series. It covers tests for uniform convergence of series, a thorough treatment of term-by-term integration and second theorem of mean value, enlarged sets of examples on infinite series, etc. Subjects treated: transmutations of singular differential operators of the second order in the real case; new results on the theory of mean periodic functions; proof of the two-radius theorem, which is the converse of Gauss's classical theorem.